The features in this stylish studio apartment in Barceloneta play with the old and new. The brightly colored décor contrasts beautifully with the mahogany upholstery and the tiled floors. There is a breakfast bar in the living area with a wonderful mosaic tiled design which compliments the red and white walls. The fully equipped kitchen is compact but superbly designed with the same chic style found throughout this apartment; a washing machine, fridge/freezer, and stove are all provided. The living area has a great feeling of light, and there is a double sofa bed and a television for entertainment in the evening after a day of sightseeing. This unique studio apartment has a mezzanine bed with an office space underneath and matching wardrobes with huge glass doors. The bathroom has been recently decorated and has all you will need to refresh yourself after a long day at the beach! 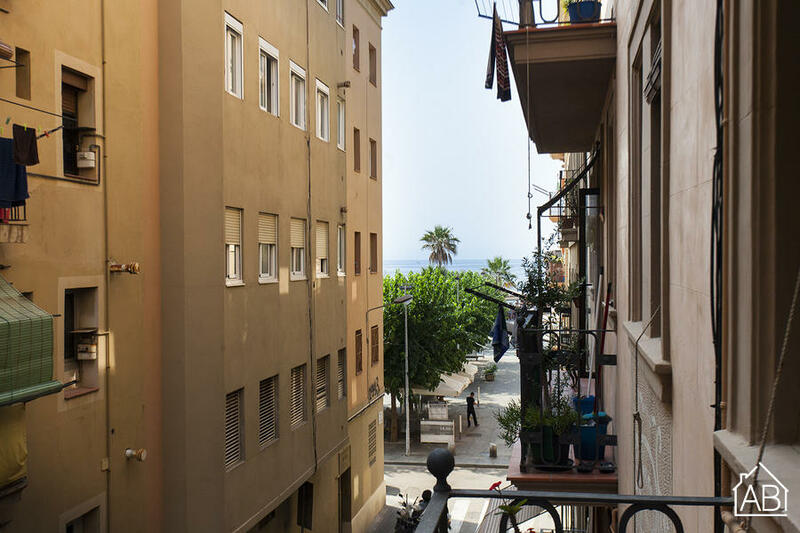 There is a balcony which has lovely sea views, perfect for having a glass of wine in the evening before heading out to sample some of the restaurants and bars that line the streets of Barceloneta. The location of the flat is excellent, just a two minute walk from the beach and a short and nice 15 minute stroll away from the city center and some of the city´s must see sights. Please note, this apartment is only available for families or for persons over 35 years old.